ZHUANSHANBAO - All "Snowflake Boy" Wang Fuman - who received an outpouring of gifts and sympathy when photographs of his ice-flecked hair and eyebrows after a freezing, hour-long trek to school went viral - wants this Chinese New Year is a reunion with the mother who left him behind two years ago. According to the South China Morning Post, the eight-year-old's message for his mother, Lu Dafeng, was: "Mum, I don't want to wait any longer only to be disappointed again … can you please come back? "Mum, I want you to beat me and scold me for my mistakes - the way other mothers do to their children. At least, then, you would be by my side. Please come back." His father, Wang Gangkui, told the Hong Kong daily that Lu had left the family in 2016 to escape a life of poverty. She came back to the family's village of Zhuanshanbao in China's Yunnan Province in July last year to ask for a divorce, but left the next day after 29-year-old Wang turned her down. "I haven't been able to find her as she changed her mobile phone number and never called us after she left," he said. "I know she hated how poor we were and believed I was not capable (of making money to better our lives). We often quarrelled over this in the past. Then she left me." Before the estrangement, Wang and Lu had been construction workers in Kunming, located more than 300 km away from their village. They would head home every three or four months to see their two children, Fuman and his 10-year-old sister Fumei, who lived in a mud house with Wang's mother. The house, built about 20 years ago, has no toilet or running water. Wang said baths, taken at the public bathroom a 10-minute walk away from home, were rare, with children and seniors taking them just once every year or two and adults once every two months. 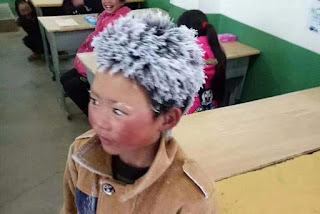 Fuman last month became an Internet sensation when photos of him in class, red-cheeked and with icicles in his hair and eyebrows, was widely shared online. He had walked nearly 5km to school in minus 9 deg C conditions. His plight drew an outpouring of gifts and donations, with the Kunming branch of China Construction Third Engineering Bureau, for one, giving 144 sets of winter clothing and 20 heaters to the Fuman's school, and Chinese Communist Party propaganda website, China Peace, sponsoring a free trip to Beijing for Fuman and his family. His father, Wang, has been given a job as a construction worker in his village so he can spend time with his children, and will start his new job atfter Chinese New Year. Wang told the South China Morning Post that in the first few months after Lu left, the children cried constantly, and kept asking for their mother. Even now, they miss her deeply, he added. "I'm still hoping for my wife to return to me. I want to tell her: please come back for the sake of our children," he said. "I may be poor now, but I believe, as long as we work hard, our lives can become better."